On July 13, 1985, at Wembley Stadium in London, Prince Charles and Princess Diana officially open Live Aid, a worldwide rock concert organized to raise money for the relief of famine-stricken Africans. Continued at JFK Stadium in Philadelphia and at other arenas around the world, the 16-hour "superconcert" was globally linked by satellite to more than a billion viewers in 110 nations. In a triumph of technology and good will, the event raised more than $125 million in famine relief for Africa. 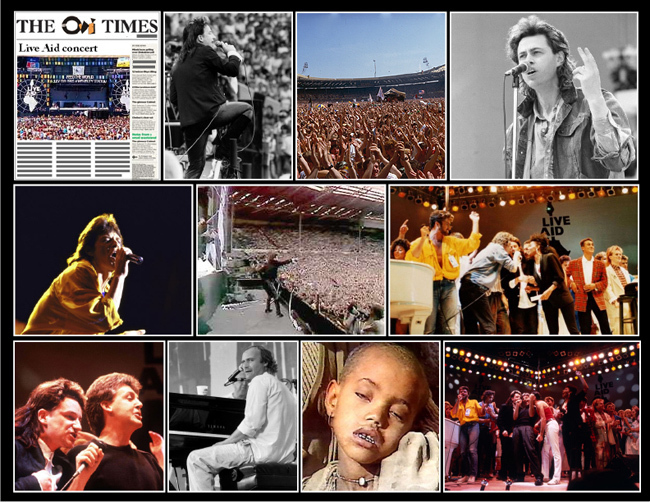 Live Aid was the brainchild of Bob Geldof, the singer of an Irish rock group called the Boomtown Rats. In 1984, Geldof traveled to Ethiopia after hearing news reports of a horrific famine that had killed hundreds of thousands of Ethiopians and threatened to kill millions more. After returning to London, he called Britain's and Ireland's top pop artists together to record a single to benefit Ethiopian famine relief. "Do They Know It'sChristmas?" was written by Geldof and Ultravox singer Midge Ure and performed by "Band Aid," an ensemble that featured Culture Club, Duran Duran, Phil Collins, U2, Wham!, and others. It was the best-selling single in Britain to that date and raised more than $10 million.